So put to death the sinful, earthly things lurking within you. Have nothing to do with sexual immorality, impurity, lust, and evil desires. Don’t be greedy, for a greedy person is an idolater, worshiping the things of this world. impurity, lust, evil desires, and greed. Unwanted advances in our lives do not have to be acknowledged or allowed or tolerated — and it is the same with temptations and desires that we know are not Godly. So humble yourselves before God. Resist the devil, and he will flee from you. Come close to God, and God will come close to you. Wash your hands, you sinners; purify your hearts, for your loyalty is divided between God and the world. Let there be tears for what you have done. Let there be sorrow and deep grief. Let there be sadness instead of laughter, and gloom instead of joy. Humble yourselves before the Lord, and he will lift you up in honor. The word render means to “provide or give”. Sometimes we find ourselves with a wrong mindset about our relationship to God and His to us, even in our time of great need. When we want God to “render” for us through our requests “our will to be granted in heaven” this is not from a right mind or a right heart. See, He is master and Lord and He makes the decrees and commands, not us. The prefix sur means “over and above”. See, when we address that prefix “sur” and put God “over and above” our lives — when we truly want “His will be done on earth as it is in heaven”, it is then that the “surrender” takes place that opens the floodgates of heaven. Many would take just this one bold verse in Malachi 3:10 with hopes to use it for their own gain and prosperity, as if they could “bind God by His promise for their own profit” — but let’s see the whole of its context. God is not the means by which men would manipulate a “spiritual” financial transaction for the increase of their own will and purposes and power and honor to be increased upon this world, No! Bring the full tithe into the storehouse, that there may be food in my house. And thereby put me to the test, says the Lord of hosts, if I will not open the windows of heaven for you and pour down for you a blessing until there is no more need. I will rebuke the devourer for you, so that it will not destroy the fruits of your soil, and your vine in the field shall not fail to bear, says the Lord of hosts. Then all nations will call you blessed, for you will be a land of delight, says the Lord of hosts. “Your words have been hard against me, says the Lord . But you say, ‘How have we spoken against you?’ You have said, ‘It is vain to serve God. What is the profit of our keeping his charge or of walking as in mourning before the Lord of hosts? And now we call the arrogant blessed. Evildoers not only prosper but they put God to the test and they escape. '” Then those who feared the Lord spoke with one another. The Lord paid attention and heard them, and a book of remembrance was written before him of those who feared the Lord and esteemed his name. “They shall be mine, says the Lord of hosts, in the day when I make up my treasured possession, and I will spare them as a man spares his son who serves him. Then once more you shall see the distinction between the righteous and the wicked, between one who serves God and one who does not serve him. Master, Lord, these words when speaking of God and not self — are either heard in the ears of the wise as beautiful to you — or they are beasts as hatred and condemnation in the deaf, blind, fools who inhabit the earth. The call is not to make ourselves gods and to make God our servant, but to truly lie down in surrender and find ourselves truly sons of God. Because we are either surrendered sons of God or you are sons of another father. You adulterous people! Do you not know that friendship with the world is enmity with God? Therefore whoever wishes to be a friend of the world makes himself an enemy of God. Or do you suppose it is to no purpose that the Scripture says, “He yearns jealously over the spirit that he has made to dwell in us”? But he gives more grace. Therefore it says, “God opposes the proud but gives grace to the humble.” Submit yourselves therefore to God. Resist the devil, and he will flee from you. Draw near to God, and he will draw near to you. Cleanse your hands, you sinners, and purify your hearts, you double-minded. 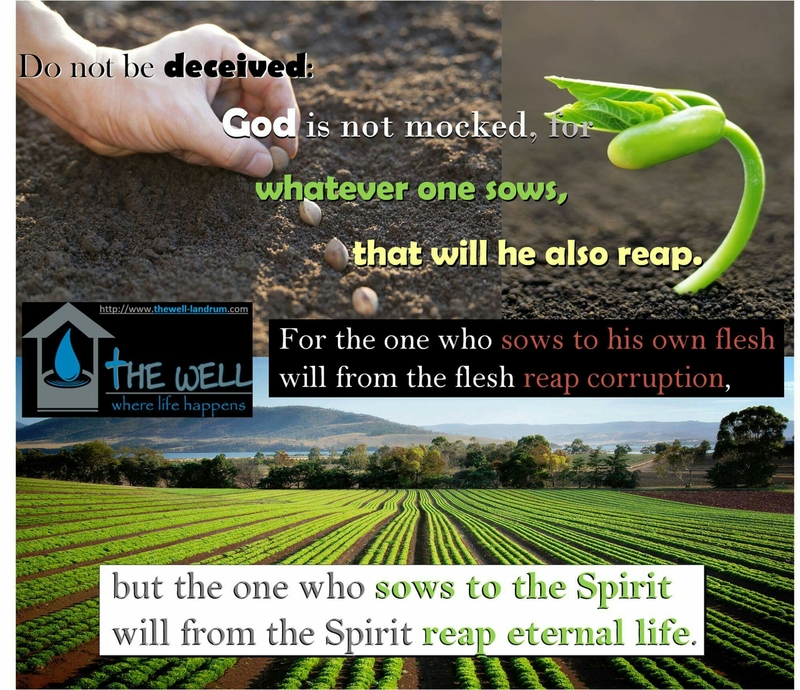 Be wretched and mourn and weep. Let your laughter be turned to mourning and your joy to gloom. Humble yourselves before the Lord, and he will exalt you. I must perform my vows to you, O God; I will render thank offerings to you. For you have delivered my soul from death, yes, my feet from falling, that I may walk before God in the light of life. What shall I render to the Lord for all his benefits to me? I will lift up the cup of salvation and call on the name of the Lord , I will pay my vows to the Lord in the presence of all his people. Precious in the sight of the Lord is the death of his saints. O Lord , I am your servant; I am your servant, the son of your maidservant. You have loosed my bonds. I will offer to you the sacrifice of thanksgiving and call on the name of the Lord . I will pay my vows to the Lord in the presence of all his people, in the courts of the house of the Lord , in your midst, O Jerusalem. Praise the Lord ! 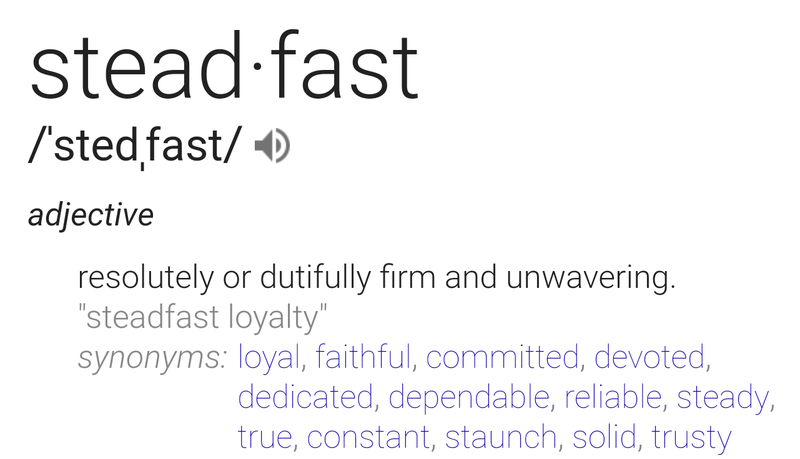 Are we fully trusting in the Lord to be faithful and true? 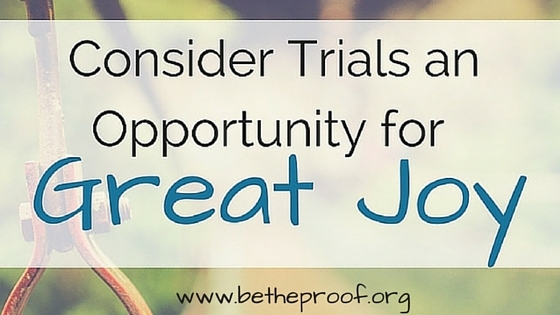 Are we fully trusting that even this trial is meant for our good and for His glory? Yes, these questions, this examining our hearts to see if faith and belief really lives there — it either brings us to the garden to rest humbly and trusting in His arms — or is has us far from Him and grumbling about not getting our own way right now. 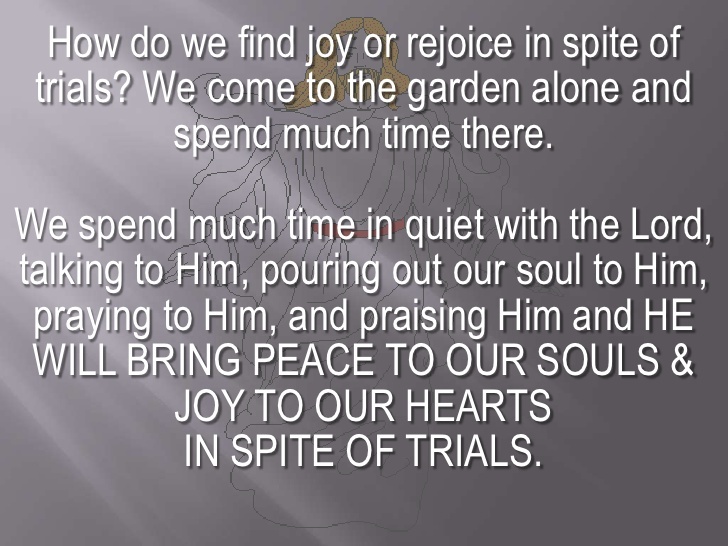 Surrender, and return to the garden, and be still and know that He is God. 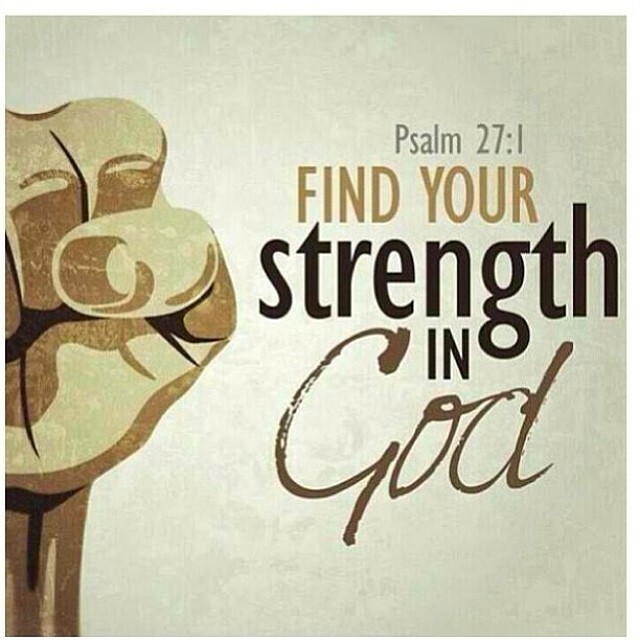 He is mighty. Trust in Him. Follow Him. He went through hardships. He was wrongly accused and hated by those he pleaded for on their behalf. He faced opposition repeatedly from the enemy that wanted to hinder his work going forth and seeing many bright into freedom and belief and life abundant no longer bound by sin and death. Don’t think that you should escape the trials, but realize that the trials are the refining fires that purify your heart and that service as your living testimony that He lives in you. LORD, empower us by your Holy Spirit to receive your Truth and see it grow up –from a Hope that it might “some day come” — to an active and abiding Faith that is seeing sin overcome in our lives to meditate upon, believe, and obey your commandments — an obedience that is not just to the letter of the law, but that teaches for that higher bar of the very Love and presence of Christ abiding in our lives as LORD over our thoughts, words, and actions. Do not let our own opinions, feelings, desires or pride rule our day, but let us die to self and walk as new creations, as more than conquerors, as ambassadors of the Way, as light set upon a hill, as a holy people set apart for your purpose and calling. Make clear to us, reveal to us that your way is, and was, and always will be and that your voice and truth has not changed. Confirm to us that your whole Word is valuable and precious and that we do not pick and choose what suits our self, but we are to submit ourselves to and believe and understand the sweet, precious, and powerful nature of this Word of God that is sharper than any sword, and that cuts to the heart of the matter so we might find repentance and life abundant in Christ. And may it all be for your glory and honor, today and forevermore. Amen. Steadfast. Unwavering. Disciplined. Devoted. Loyal. LORD, thank you for YOUR steadfast love. Thank you that YOU are served, loyal, and unwavering in YOUR love for us. We are shamed, even humiliated by the strength of your example beside the weakness of our own — if we are courageous enough to examine ourselves closely, truthfully, and honestly. We fall short and we are not the perfect ones yet that you have promised you are reconciling us to be. But we are following you, LORD. So we are no longer little unsturdy babes who cannot walk upright at all. Teach us your way, LORD. Come live in us so that we can say with confidence, “It is not I who live, but Christ who lives in me.” Show your steadfast love, your holiness, the very fruit of your nature in the life song that we live today and forevermore, as a testimony of your glory and honor and favor and mercy towards your children. Amen.